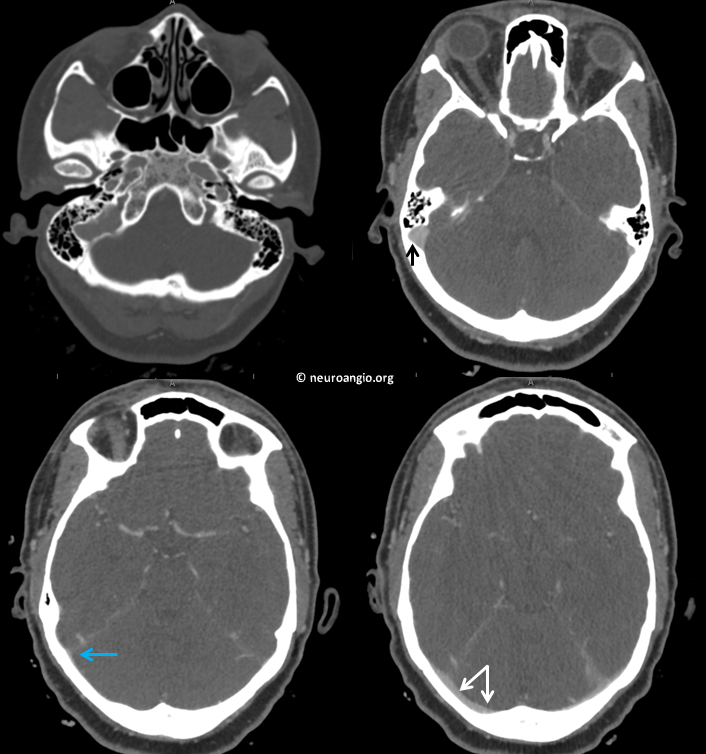 The natural history of venous sinus stenosis is overwhelmingly benign. 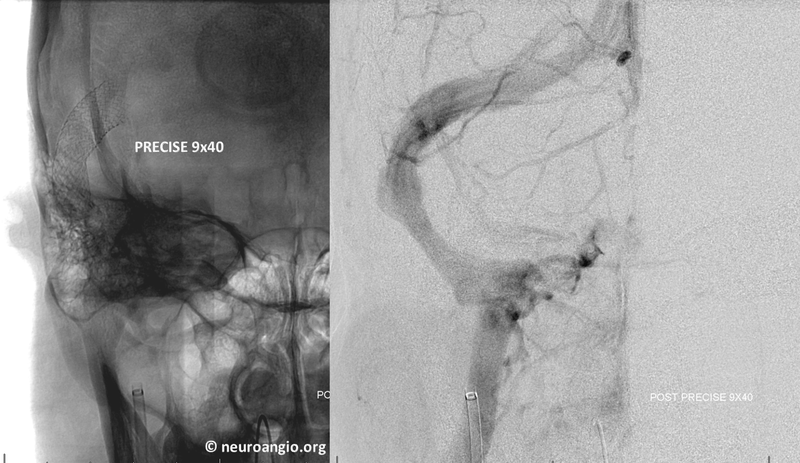 A well-recongized association between sinus stenosis and intracrnaial hypertension now exists. 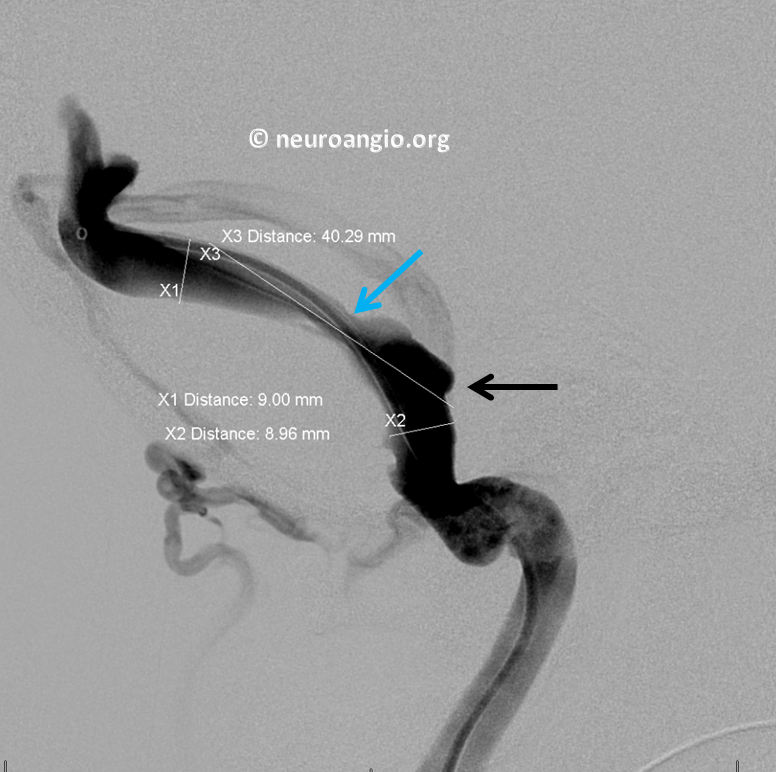 However, not all patients with venous sinus stenosis have intracranial hypertension and vice versa. For those with isolated sinus stenosis, the long-term prognosis appears favorable. Most patients with pulsatile tinnitus due to venous stenosis are able to tolerate the sound, especially once they learn that the cause is usually not “dangerous”. However, for a substantial minority the sound is loud, constant, disruptive and profoundly disturbing. 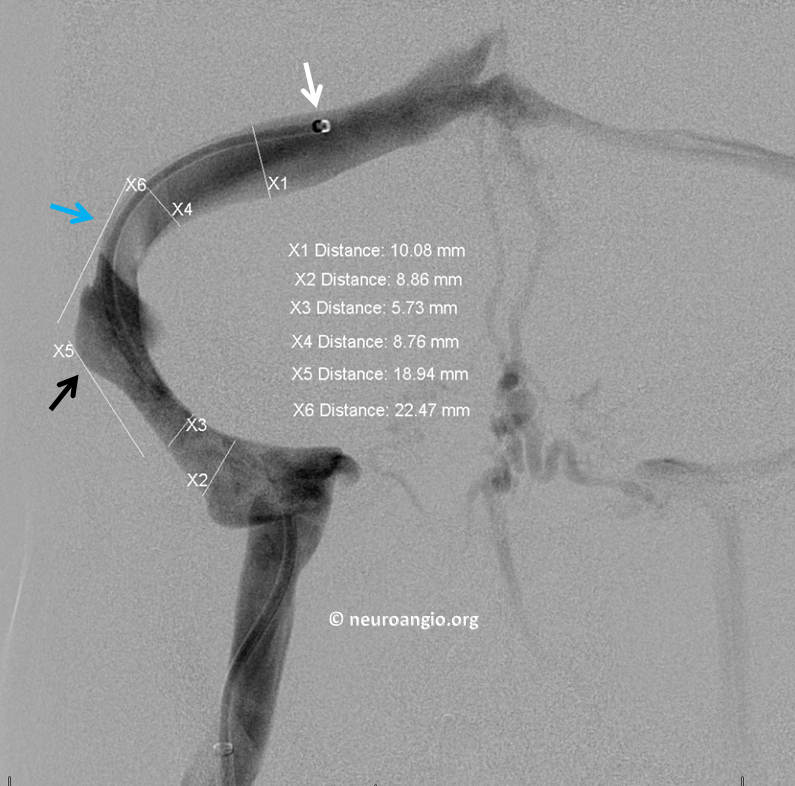 In such cases, venous sinus stenting can be extremely effective as a durable cure. This patient presents with a loud, constant, whoosh-like sound on the right side, which can be completely abolushed by right jugular copression. A faint bruit is heard over the mastoid bone. Some very loud venous sounds can be uscultated, partiularly with a good stethoscope in a quiet room. 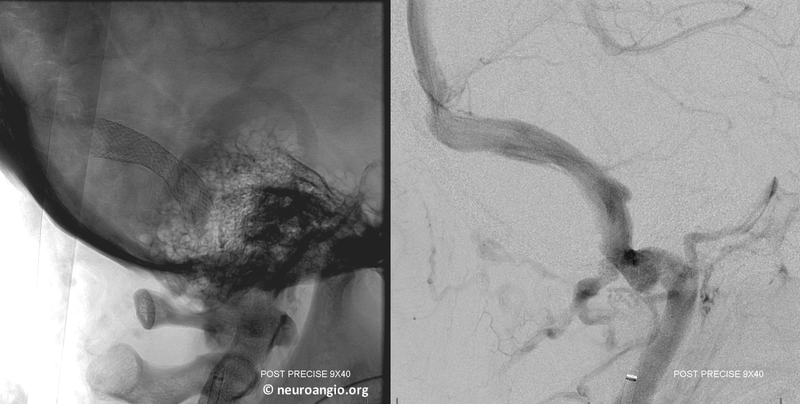 Our typical workup is a noncontrast brain MRA, contrast brain MRI (which is as good as an MRV), and contrast neck MRA. This patient came in with an outside CTA. 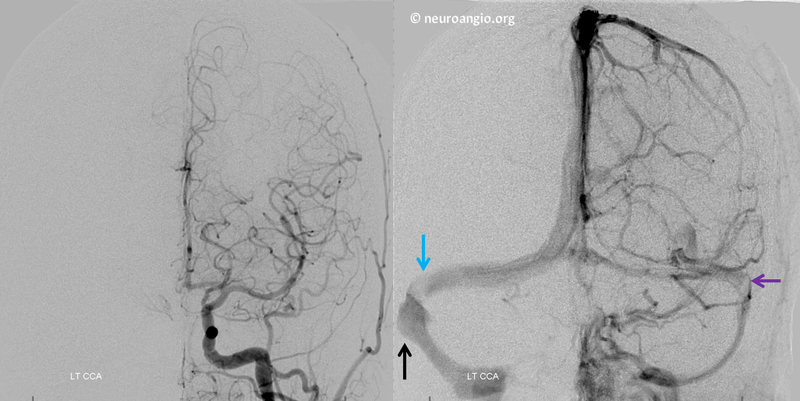 Fortunately, the CTA was bad with lots of venous contamination, which allowed for visualization of venous sinuses. Right sided outflow is strongly dominant. 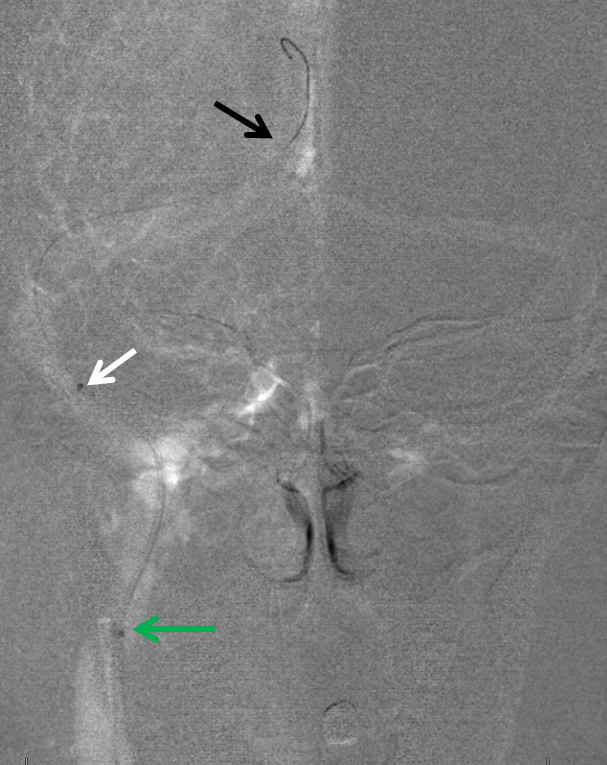 Stenosis is shown by blue arrow. 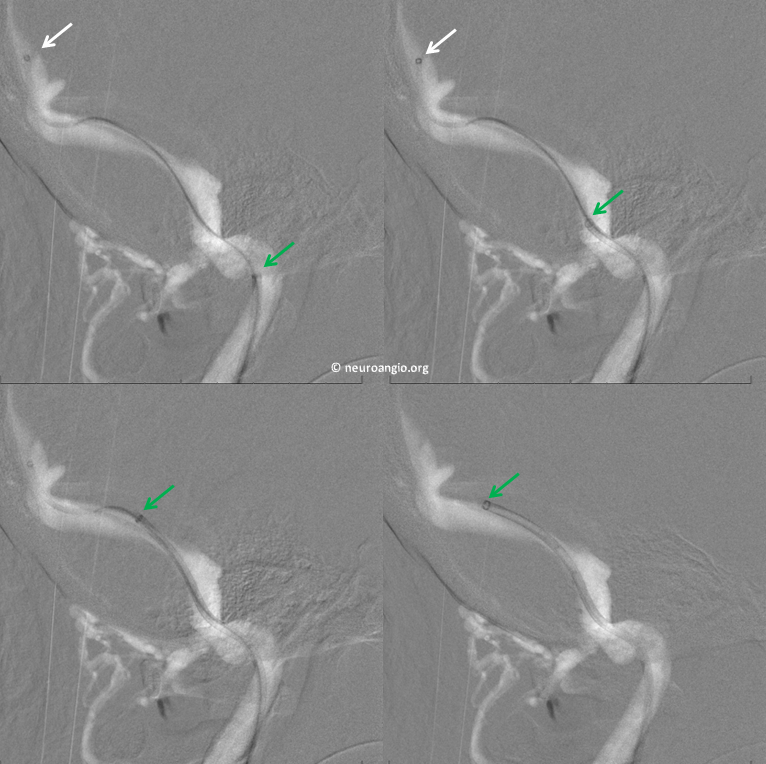 Notice a post-stenotic diverticulum (black arrow) with bony remodeling. 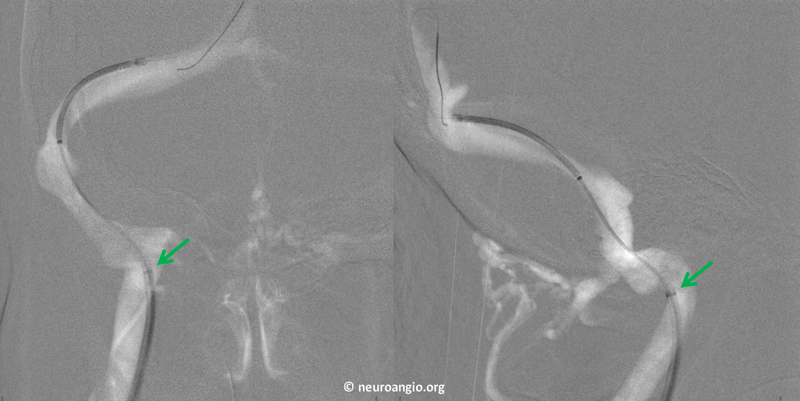 Diverticulum is a frequent bystander in sinus stenosis. It is not the primary problem and only very rarely the cause of pulsatile tinnitus. Stenosis is. Angio. 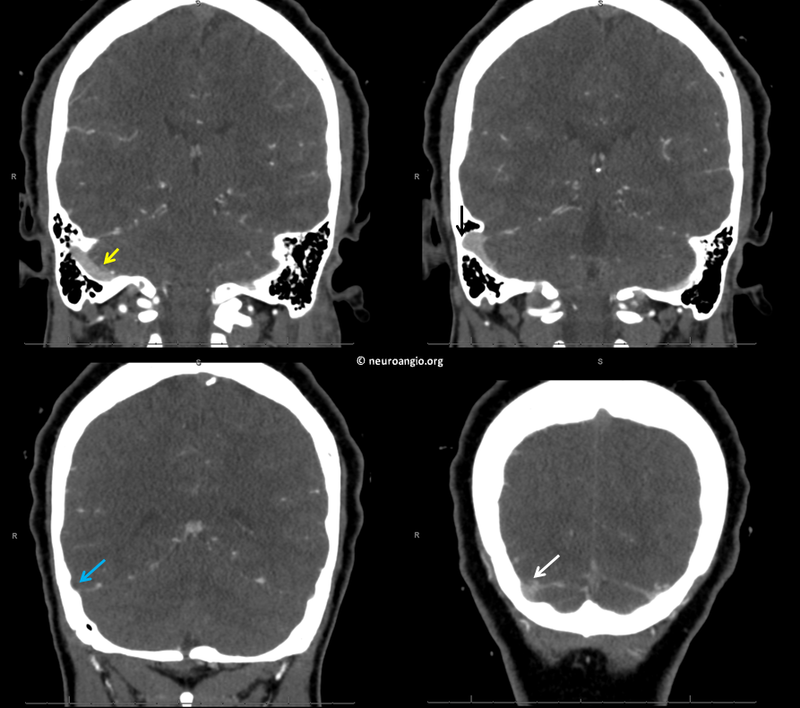 Typical flattened appearance of stenosis (blue arrow) with reduced contrast density in frontal view. Post-stenotic dilatation/deverticulum is black. 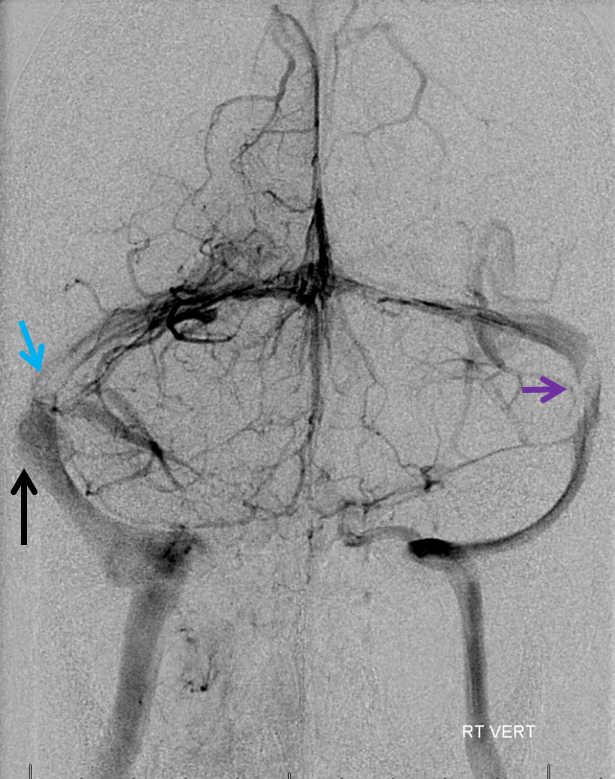 Mirror image stenosis on the left (purple). 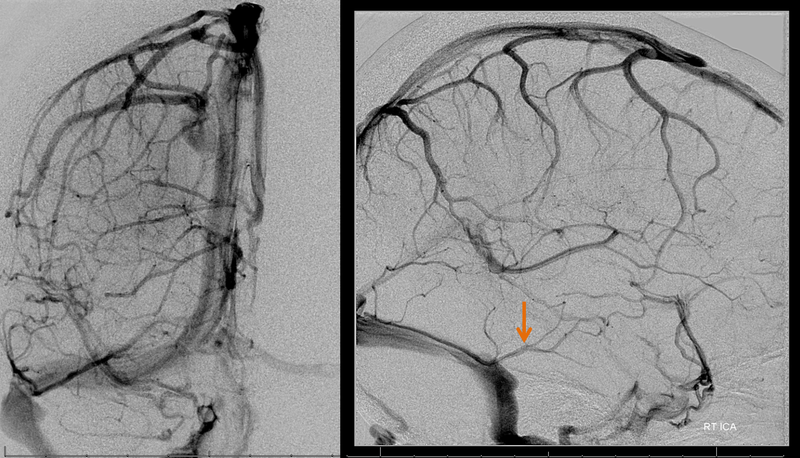 A full angiogram with external/common injections was done to show absence of dural fistula or other cause. 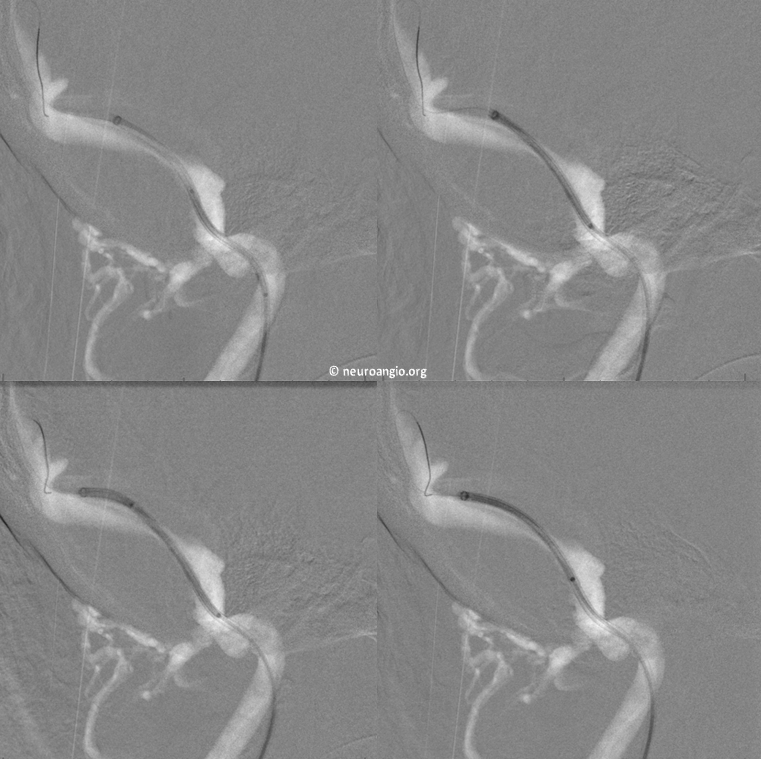 Now we move on to stenting. A NeuronMax 90 cm sheath (green arrow) is placed into the jugular. 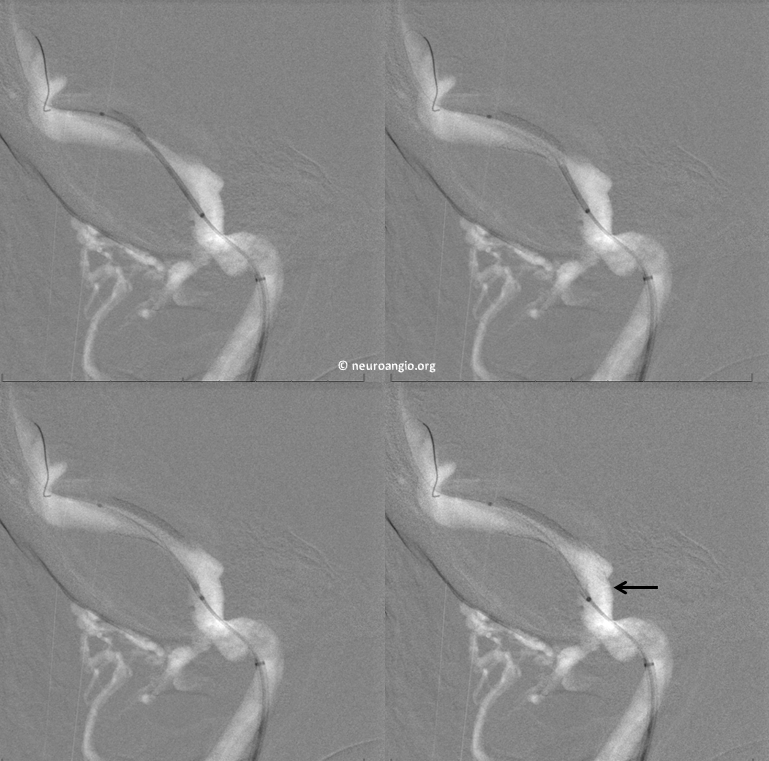 A 5F Sofia or another similar distal support catheter (white arrow) can be used to get high quality images of the sinus for morphology and measurements. A Volcano 014 pressure wire (Pressure sensor at black arrow tip) is placed into the sinus system to perform pressure measurements. 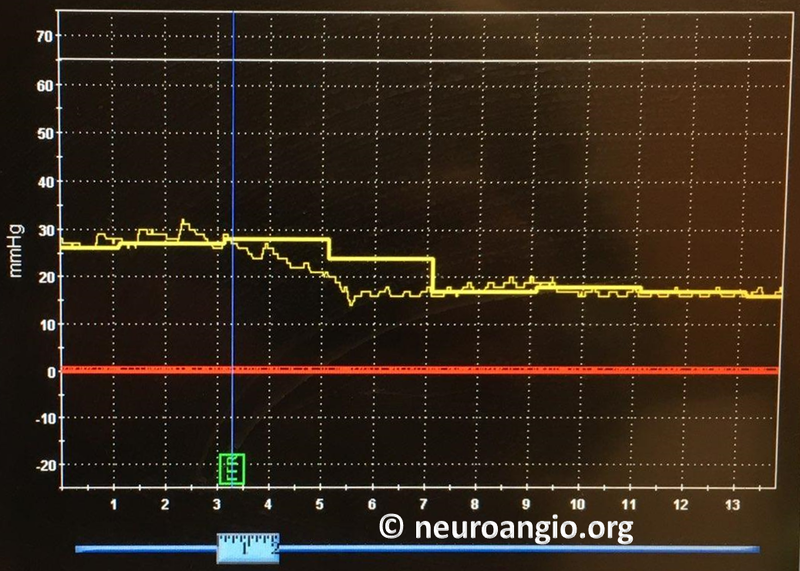 Existence of pressure gradient across the stenosis is a constant feature in venous pulsatile tinnitus. How much gradient exactly is necessary is not established. Usually, it is a focal drop over a short segment of more than 5 mm Hg. Next, we get a good picture by injecting the Sofia. Measurements are made. Pulsatile tinnitus is gone. 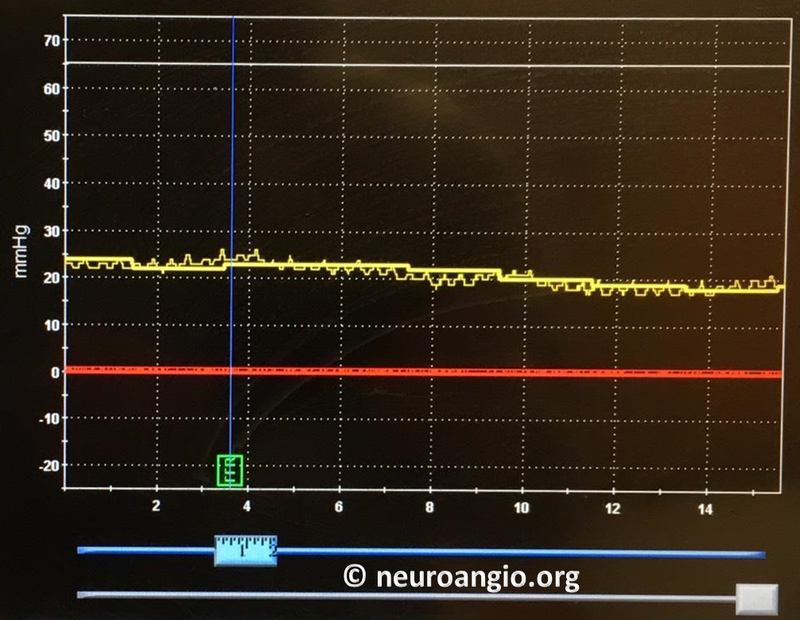 In every case of venous sinus stenosis where the patient has been able to abolish the sound by jugular compression and no other cause was found, venous stenting resulted in immediate, complete, and permanent cure of pulsatile tinnitus.